This is probably a very dumb question but I don't get it. Usually people say if there are more buyers then the price goes up, and if there are more sellers it goes down. Why is that? And in which situation you have a different number of sellers/buyers? I thought for every seller there is a buyer right? Regarding to the price, I read the market price is the price of the last "transaction". But how is made that transaction? If the price is $100, and I buy it at price market (I don't understand who is the seller/buyer on instant orders by the way...), then the last transaction will be $100, we don't move it. If we put a limit buy order, we need to put it below $100, let's say $99. And the limit sell must be higher, let's say $101. So who is moving the price to $99 or $101? if nobody can sell the stock at $99 or buy it at $101 because the market rules? Can somebody put a simple example to make me understand why and how the market prices changes? There isn't a thing like "market price" there are always two market prices, highest bid and the lowest ask on the order book, those are the prices for market orders, and the last transaction prices means nothing, just a reference. if there are more buyers then the price goes up, and if there are more sellers it goes down. Why is that? Simple Demand and supply. If more people "Want" to buy ... sooner or later someone will increase the price at which they want to buy ... like wise if more people want to sell ... sooner or later some seller will lower the price. And in which situation you have a different number of sellers/buyers? I thought for every seller there is a buyer right? Yes for every trade to happen, there are equal number of buyers and seller. However there are tons of trades that don't happen. These remain unfulfilled, hence in reality there can be more buyer or sellers for a particular stock or in general in stock market on a given day. The term buyer or seller is used to indicate the "intent" of these persons on a given day ... and not fulfilled orders. Related question: What does "more buyers than sellers" in technical analysis of stocks actually mean? These are matched on price time priority basis. Related question: How do exchanges match limit orders? The supply and demand comes from the orders in the order book. For every trade to occur the bid and ask have to match, however there are many orders in the order book that don't get executed straight away. During the day orders get executed, orders get cancelled, orders get added and orders get amended. The demand (bids) can increase or decrease during the day as can the supply (asks) as these orders are executed, added, cancelled or amended. A transaction takes place when a bid and ask price are matched. This can occur when a market buy order is placed matching the lowest ask order/s or when a market sell order is placed matching the highest bid order/s. It can also occur when a limit order is placed or amended to match the lowest ask (for a buy order) or the highest bid (for a sell order). This creates a transaction being the last market price. In your example, you can place a limit order at what ever price you want. If the last market price is $100 and the highest bid is $99 and lowest ask is $101, then you could place a bid order at $100 and go to the top of the bids list, and wait for someone to match your price on the sell side or to place a market sell order. The market price will thus remain at $100. Or you could place a limit buy order at $101 and match the current lowest ask at $101 and buy the stock straight away. In this case the market price will now move up to $101. Hundreds of these order occur every minute on liquid stocks. 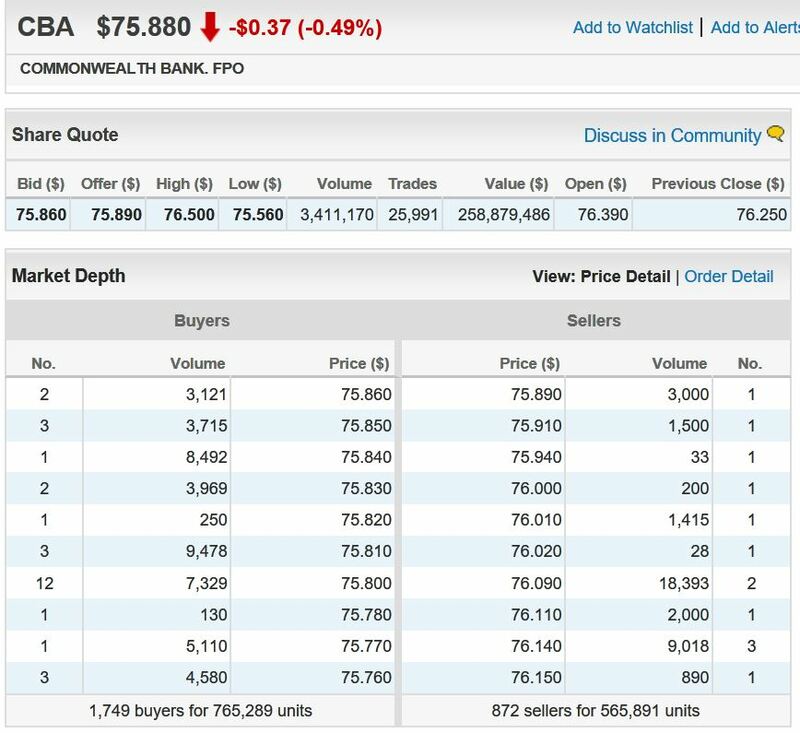 CBA Order Book showing bid and ask prices as well as last market price. After market limit buy order placed above last market price. This demonstrates that a buy limit order can be placed above the last market price. If you have an illiquid stock the last market price might have occurred hours before hand, and in the mean time the bid and ask prices could have moved quite a distance from the last market order. If this was the case prices would never change because no bid price would ever be matched up with an ask price. Throughout the day, if a similar amount of buying and selling volume comes in at current price, there is equilibrium and price goes nowhere. If an excess of one comes in, price changes. For example, every time a buyer takes out a seller, if no new seller comes in at current price, price moves up ($50.10 to $50.20 as above). If another buy occurs and new sellers don't come in at the new current price, then the ask price moves up again. That also entices new buyers in at higher prices so perhaps the next quote is $50.20 x $50.35 with a size of 2x9. The longer this continues, the higher share price goes. Note that it is the aggregate buying and selling volume transacting that matters rather than the number of buyers and sellers. 10 buyers of 100 shares each has the same effect as one buyer of 1,000 shares. So it's not the number of buyers and sellers but it's the buying volume versus selling volume that moves price. Not the answer you're looking for? Browse other questions tagged financial-literacy stock-markets stock-valuation or ask your own question. How do exchanges match limit orders? What rules must your broker follow when buying/selling shares for you at the market price? Why can't I place a stop sell order and a limit sell order for the same shares?